are you saying that there are many bike thieves in Shanghai? I assume they steal other things besides bicycles. Shrek7, yup there are a lot of them. They are a smooth criminals. They will come in a gang with tools to cut the thick bicycle locks. And they don’t hesitate to operate in the broad day light and crowded places. My friend’s was stolen even though he parked his bicycle at crowded area where Carrefour and banks are located. The worst thing, is the passer-by are ignorant enough didn’t even warn/ scream at the kids where they saw them trying to steal the bicycle. Chinese use to say “I have loose a bicycle” instead of “someone has stolen my bicycle”. Why? When I arrived in China with a few other foreigners, we all bough new bicycles… mine (stolen inside my building, the guard who knew very well my bicycle did nothing to stop the robber), my flatmate one, two of my second flatmate, one of my friend, his girls friends friend, etc… all have been stolen within 3 months. So, I bought a old crappy one, one year later someone STOLE it. PS: I do not find funny to see someone who has been STOLEN. DC you are totally right!!! It has happen to one of my friend! They stole in front of everybody and nobody do something…. Most of Chinese do not care as long as it is not related to them, and they want to avoid conflict. By the way most of them do not care to let way to ambulance… whatever some may die because the ambulance is slow down by bicycle and cars. 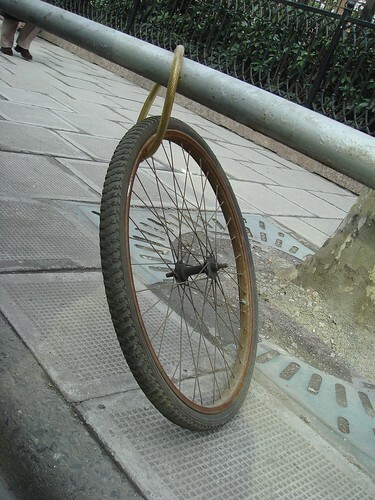 lol, how do you know it’s not a unicycle. It’s the same condition in Beijing, especially in the college. But it’s a little better now. Just have a wheel left……..I have saw it in TV,It’s really funny in daily life. The pohto is great, :) .xixi. For the sake of argument and in defense of “most of the Chinese”, most people do not stop thieves/robbers because they do not feel confident enough that it is safe to do so. If you shout out, it is very likely that others won’t help and the police won’t arrive in time. People do not yield to ambulance because there are many cases that ambulance and police vehicles flash their emergency lights when there is no emergency. I have seen too many police vehicles run lights but drive in a way that does not seem to be in a hurry.